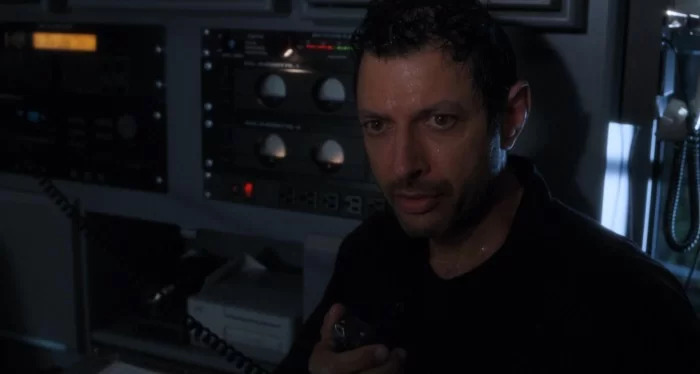 Dr. Ian Malcolm is a key character in Jurassic Park and The Lost World. He is a mathematician at the University of Texas at Austin and specializes in chaos theory. 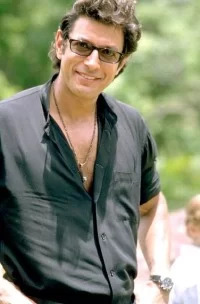 In the films, he is portrayed by Jeff Goldblum. His character is based on Ivar Ekeland and James Gleick and his all-black clothing style reflects that of Heinz-Otto Peitge who is a well-known mathematician. Like in the movie, Ian Malcolm was part of the evaluation team. He was a mathematician and was very sceptical about the park and knew it would be a failure. When the Tyrannosaurus rex escaped and attacked one of the cars, Malcolm panicked and ran outside. The T-Rex chased him and picked him up in its powerful jaws. It shook him around and threw him down. Malcolm broke his leg in the fall. Muldoon and Gennaro found the injured Malcolm and took him back to the Safari Lodge where he was cared for by Gerry Harding. He spent the rest of the novel bed-ridden, continuing to point out all the park’s flaws and shortcomings. He was later airlifted from the island and taken to Costa Rica for medical treatment but it was later mentioned that he had died. In the sequel, Malcolm explains that his death was premature thanks to the fast work of the surgeons in Costa Rica. He survives but ends up with a permanent leg injury, requiring a cane to walk. 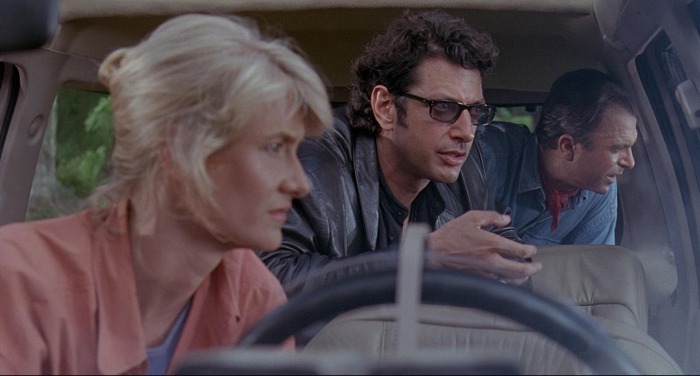 The novel begins with Ian Malcolm giving a lecture on Extinction and Chaos Theory. After the lecture, Malcolm and his ex-lover Sarah Harding are having lunch when a paleontologist called Richard Levine wants him to help him find this “lost world” where dinosaurs could still be alive. Ian refuses but eventually goes when he finds out Levine has gone alone and is trapped on the island. He takes charge of Levine’s expedition and organises a rescue operation. This version of Malcolm in the novel seems to be more proactive and knows a lot more about dinosaurs than his film counterpart. Malcolm is attacked once again by a Tyrannosaurus Rex and injures his leg. Malcolm joined the group for a tour in the Ford Explorers, only for them to break down in front of the Tyrannosaurus Rex enclosure. The T-Rex escapes and attacks the children’s car and he lights a flare to try and distract the creature. He throws away the flare but the T-Rex continues to chase him towards the toilets and is thrown to the ground in the chaos. Ellie and Muldoon come to his rescue and he’s badly hurt his leg. They put him in the jeep and escape the Tyrannosaurus Rex. They return to the control room and then the bunker where they talk about restoring the park’s power. When the systems come back online, Malcolm and John Hammond drive back to the visitor’s center to pick up Grant, Ellie and the children. They drive to the helicopter and leave the island. Ian Malcolm is a more central character in The Lost World. It takes place six years after the events in Jurassic Park. Malcolm tries to tell the public about his experiences on Isla Nublar but John Hammond’s nephew Peter Ludlow discredits him. John Hammond tells Malcolm about Isla Sorna, an island where the dinosaurs were bred before they were brought to the main island. He asks Malcolm to go to Isla Sorna with a team to document the dinosaurs in their natural habitat in order to garner public sympathy and prevent corporations from profiting from the island. Malcolm initially refuses to go but then quickly changes his mind when he finds out his partner Sarah Harding, a biologist, has already gone. He meets other members of the team, Eddie Carr, and Nick Van Owen and makes plans to leave for the island. When they reach the island, they search for Sarah using a satellite phone and find her photographing a herd of Stegosaurus. They return to the trailer and find out Malcolm’s daughter, Kelly, has hidden away in the trailer. He tries to persuade Sarah to leave the island but they are interrupted by the sight of InGen helicopters flying over the island. Malcolm and his team watch as InGen chases the dinosaurs and violently capture several of them. When Ludlow is giving his presentation with his intentions to create a new Jurassic Park in San Diego. Sarah and Nick sabotage the cages and lets lots of the dinosaurs loose. Malcolm takes Kelly back to the trailer when Sarah and Nick arrive with an injured infant Tyrannosaurus Rex. Malcolm takes Kelly to the high-hide in the trees when he sees something big coming toward the trailer. He races back to the trailer to warn the others when two adult T-Rexes arrive. Sarah gives the infant back to its parents but the T-Rexes attack the trailer and push it off the cliff. Nick, Sarah and Malcolm are rescued by Eddie who throws a rope down to them. They are helped back up by Roland Tembo, who is in charge of Ludlow’s team and they decide to work together to get off the island. They agree to travel to an abandoned facility in the centre of the island to call for help. When night comes and everybody is asleep, a Tyrannosaurus comes into their camp. In the chaos, Sarah, Kelly and Nick end up behind a waterfall trying to avoid the T-Rex. They escape and wonder into the tall grass but are attacked by velociraptors. Malcolm is hurt slightly and Nick goes on ahead and reaches the facility to call for help. Soon enough, Malcolm, Kelly and Sarah reach the facility but are attacked by three velociraptors. They escape the facility in a helicopter, and leave Isla Sorna. Some time later, it appears Roland managed to tranquilize the Tyrannosaurus and is bringing back to the dock in San Diego. Sarah and Malcolm try to watch the press conference that Ludlow is giving at the dock but the ship holding the creature crashes into the dock and the T-Rex escapes causing mayhem in San Diego. Ian and Sarah drive to the new park and steal the infant Tyrannosaurus and the adult Tyrannosaurus Rex gives chase. They lure it back into the freighter where Malcolm traps the T-Rex in the cargo bay. Malcolm is then seen on a couch with Sarah and Kelly, watching the news report on the freighter making its way back to Isla Sorna. 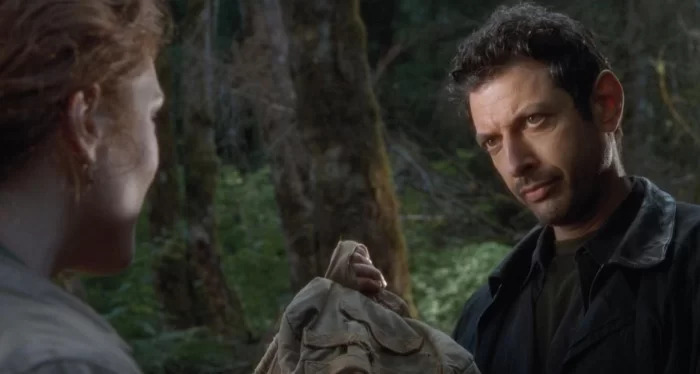 Ian Malcolm doesn’t appear in Jurassic Park 3 but he is mentioned by Alan Grant and Eric Kirby. Eric said he didn’t like Malcolm’s new book and called it “preachy”. Alan smiled and jokingly said “that’s two things we have in common”.